Westy, have a great birthday and thanks for all the fun in the Champbox. This card is Totes Adorbs!! Happy Birthday Westy girl!! Westy you are so blessed to have such wonderful friends and support and WE are blessed to have them and YOU on this incredible site. Thanks, PN. CHamp Box support crew rocks! I love this. I love the McG pics, especially top left, I love the koala pics, I love everything about this card. I think I’m going to have an #awkwardchickflickmoment right….now. I honestly don’t know what I’d do without you both, A and A. Certainly this blog would be dying a slow death, due to my real life commitments at the moment and for the next few months. But you’ve both given it a much needed boost and new life so we can keep it going – and for that I can’t thank you enough. REAL, REAL, REAL LOVE! My support crew – both of you- and Steph and Justine – are fkn amazing! Happy Birthday, Westy! Thanks for your wonderful Champ Box; it’s one of my favorite places to hang out. Alicia and Andrea? Killer card. Bravo! Shucks. Talk about an #awkwardchickflickmoment…thanks for the welcome! I second that. Always look forward to reading your comments. 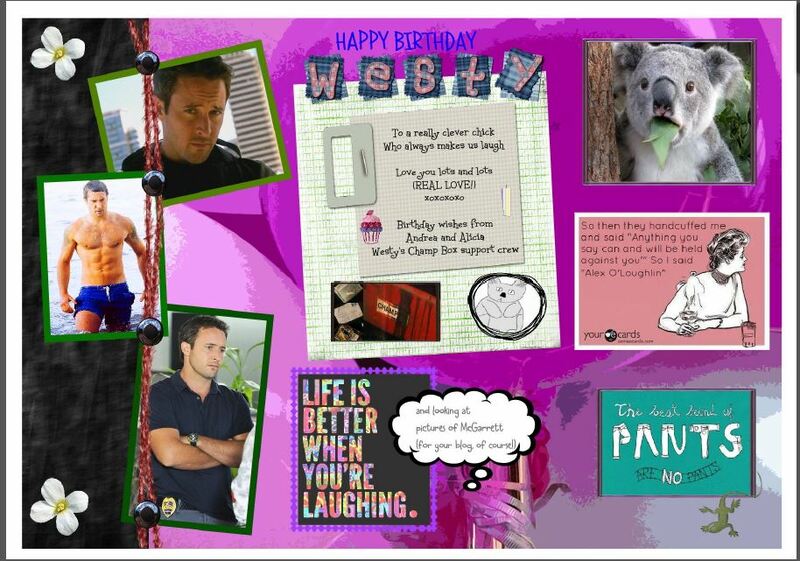 So glad that you love the card, Westy. I think I’m having an #awkwardchickflickmoment myself right now, reading all of the comments. Alicia and I are totes honoured to be your support crew. And thank you to all who are part of the Champ Box community for taking the time to visit the blog. I’m having an absolute ball being part of it. Hope you’re having a fab day, Westy. We love you heaps xxxx. Wonderful card. Well done everyone! Andrea one thing is for sure, Westy always gets a laugh out of me. I always remember in those early days on Sardonic and seeing Westy’s great sense of humour – I just knew I needed this person in my life!! Couldn’t agree more, FOYeur, and thanks for the lovely comment. Westy cracks me up! I just HAD to put that pic in about life is better when you’re laughing. So true!